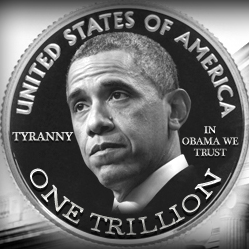 "StopTheCoin.com: Stop the Trillion Dollar Coin!" StopTheCoin.com: Stop the Trillion Dollar Coin! UPDATE: 1/12/2013 We did it! We stopped the coin! "Neither the Treasury Department nor the Federal Reserve believes that the law can or should be used to facilitate the production of platinum coins for the purpose of avoiding an increase in the debt limit," said Treasury spokesman Anthony Coley. It sounds like a joke. It should be a joke. But it is real: Liberal pundits and Democratic members of Congress are urging President Obama to mint trillion-dollar platinum coins to fund continued government spending above the federal debt ceiling. Joe Firestone, the blogger who first proposed the idea, is now calling for a $60 TRILLION platinum coin to be minted. That would mean completely eliminating all bond-market discipline on federal spending and effectively eliminating the debt ceiling without the approval of Congress. Former CBO Director Douglas Holtz-Eakin has explained: "Financial markets viewing this clumsy subterfuge would quickly come to the correct conclusion: a country so unable to manage its finances that it resorts to issuing the [coin] is essentially the same as a country so unable to manage its finances that it breaches the debt ceiling. Confidence in the U.S. would plummet, leading to a spike in interest rates and unthinkable economic pain." The coin trick is also probably illegal. Edmund Moy, a former director of the U.S. Mint who served under Bush and Obama, has argued that by statute the platinum coin would be worth only its precious metal weight, not its face value. "It may be legal to mint a platinum bullion coin with a $1 trillion face value," Moy wrote, "but it's not legal to pass it off as actually worth $1 trillion if there isn't $1 trillion of platinum in it." But it is unclear who might have standing to legally challenge the scheme, and it has somehow seemed to have passed the laugh test and entered the realm of political feasibility. Fortunately, Congressman Greg Walden of Oregon has introduced a bill to close the loophole and BAN the platinum coin trick. Please sign on below to tell your Member of Congress and Senators: "Ban the platinum coin trick now and get serious about cutting spending." Michael S. from Burlington, WV signed. Someone from Pollock Pines, CA signed. Cornelius L. from Vista, CA signed. Karolyn C. from Pompano Beach, FL signed. Put an end to Executive Government abuses and irrational spending.